ElViento: It’s no secret: the control (or lack thereof) shown by the Cougar baseball pitching staff this year has hurt the team. But just how much? Let’s take another ill-advised foray into sabermetrics to get an estimation. As of last weekend’s games, the Cougars ranked dead last in conference in walks allowed by the pitching staff, with a staggering 215 walks allowed through 334 innings pitched. Add in 42 hit batsmen, and you have entirely too many free base runners for the opposition. Using Bill James’ component ERA formula, given the Cougar pitching staff’s peripheral statistics through 38 games, the expected team ERA would be 6.38. The actual team ERA was 6.09. We’ll keep that 0.29 difference in mind, be it due to dumb luck, differences between the college and pro games, whatever. We will also be using expected W-L record, which predicts that the Cougars would have 16.6 wins (actual: 16) through 38 games. So, let’s see how much control has haunted the Cougars. First, let’s take UAB as an example. UAB has gotten league-average control from its pitching staff thus far. Taking UAB’s BB+HBP/9 IP and extending it to how many innings the Cougar pitching staff has thrown, that would leave the Cougars with 192 free runners allowed instead of 257. How much of a difference is that? It would drop the Coogs component ERA by better than a run, from 6.38 to 5.37. How many fewer earned runs would the Coogs have allowed this year with a 1.01 lower ERA? Thirty-seven. Take away 37 runs allowed from expected win-loss, and you see expected wins rise by 3.00. In one sentence, that means that if the Cougar pitching staff had league-average control, we’d be three wins better than we are. If three wins doesn’t seem like a lot, keep in mind we’ve only played 38 games through the span of this sample. If we had league-average control, our winning percentage would be 8% better. If at least two of those wins came in conference play, we’d be in a tie (in the loss column) for second place in conference play instead of dead last. Let’s take it a step further. What if Cougar pitchers had good control? Let’s take ECU’s conference-leading control, and see what effects it would have. At the rate ECU allows free baserunners, the Coogs would have allowed 125 free baserunners at this point, a drop of over half. That would drop team ERA by an expected 1.98, which would translate in a drop from 6.09 to 4.11. A difference of 1.98 over 334 innings means seventy-three fewer earned runs allowed. By expected wins, that would give the Cougars at least twenty-three wins. Let me repeat that. If our pitching control matched that of ECU, we can expect that our team would have been 23-15 heading into the last two midweek games, instead of 16-22, which it actually was. We would be in second-place in Conference USA, easily. I just don’t get it. Last year’s team wasn’t very good because there wasn’t enough talent. There is undeniable talent on this team. But it hasn’t translated into wins. Bad pitching control is a factor, but it’s not the only factor. What else has gone so wrong this year? I don’t know. Sometimes, numbers only tell you so much. ElViento: I have been attending sporting events my entire life. Some of my earliest memories are of my father taking me to California Angels games. For the last three years, I’ve been attending every UH sporting event possible. I’m a fan, but I’m also a heckler. I’ve yelled things at opposing players and referees that I’m not proud of. I think a good rule of thumb is that if you’d be horrified to have your mother hear you say something as a heckle, you probably shouldn’t say it. I’ve crossed that line many times. Now. As I mentioned, I have said many horrible things to umpires. 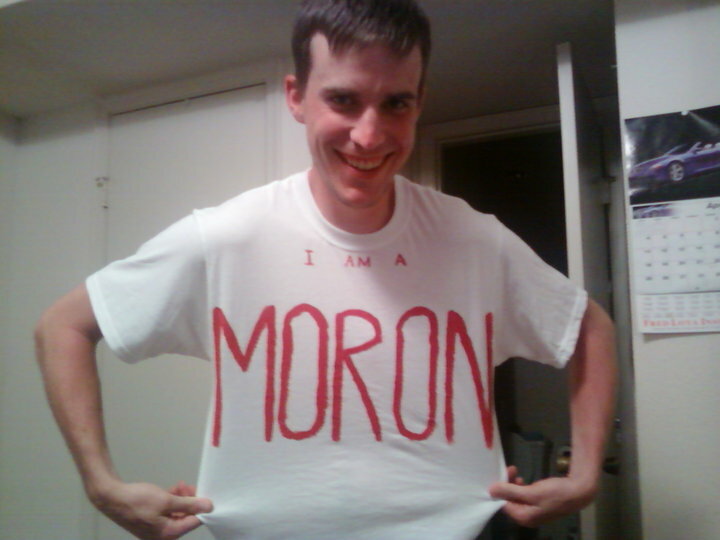 “Moron” doesn’t crack my all-time top 25. Was it over the line in this instance? Perhaps a little. But I think we can all agree that home plate umpire Walter Hill overreacted a tad. Hill immediately ripped off his mask, glared down at my section, and then called over the UH facilities manager. Next thing I know, I see security headed my way. After no small amount of futile argumentation, all four of us left the stadium. You might think that would be the end of the story. You would be wrong. Oh my, would you be wrong. Someone came up with the bright idea to head out to right field, where one can see into the stadium from the sidewalk. Figuring they couldn’t throw us out of…public, we headed out there. ECU right fielder Vanessa Moreno (whom we had been heckling from our seats earlier) smiled and waved sarcastically when she noticed us. For the last couple innings of the game, we heckled and cheered from right field. We climbed the fence, held on to the top, and loudly sang the alma mater. UH fans, and players (most noticeably freshman Reina Gaber) waved at us, and cheered us on. The Cougars hung on for a 4-3 victory. Post-game, we conversed with a number of fans and parents of players. They teased us good-naturedly about being “naughty”, while also expressing shock that we had been ejected as an entire row, without so much as a warning. A number of players came out, thanked us for showing up, and informed us that Houston head coach Kyla Holas had chewed out both the umpire and facilities people about the way the situation had been handled. Holas herself walked past and smiled at us, while filing a complaint with Conference USA offices on her phone on our behalf. Heck, even Moreno walked past, laughed, and asked us to transfer to ECU to cheer for them. The next day, we showed up (with reinforcements), cheered on the Cougars and got glared at by Hill, but managed to stay in the stadium. Best of all, the Cougars won the rubber match against the first-place Pirates. Did I mention that I was friend-requested on facebook by a Cougar softball player (junior Angela Spittler)? At one point, the partially-deaf Spittler wrote that the Coog Crew student section for softball (composed of maybe half a dozen fans at any given game) is “loud enough for me to hear”. Pinnacle of my life of sports fandom? Quite possibly. -In other Cougar sporting news, tight end Fendi Onobun was drafted with the first pick of the sixth round by the St. Louis Rams. Onobun, you may remember, was a transfer from Arizona, after playing four years for the Wildcat basketball team. Despite grabbing just two catches, Onobun, a physical freak, was drafted on potential. He joins former Cougar Donnie Avery on the Rams roster. Best of luck to Onobun. -It was a disheartening weekend for the Cougar baseball team, but don’t lose hope. After a series sweep at the hands of previously-last place Southern Mississippi, the Coogs now own that dubious distinction. The rather depressing possibility of missing out on the conference baseball tournament, which we host, is forefront on many fans’ minds. (The top 6 teams, out of 9, qualify for the tournament.) Still, with the conference slate just half-played, the Cougars stand only two losses behind second-place in conference. The Coogs need to have four good conference series to end the year, but the season isn’t lost. That’s all for me for now. I’ll be up at Sam Houston State on Tuesday, and at Cougar Field on Wednesday. Hope to see you there! ElViento: If you got a strange feeling of deja vu while reading up on the Houston Cougars hiring Todd Buchanan as the new women’s basketball coach, you’re not alone. -You have the splashy, big name with baggage: first it was you-know-who on the men’s side (it rhymes with Willie Slide Fill-espy), then Cynthia Cooper-Dyke for the women. Fill-espy came with questions about his alcoholism, Cooper-Dyke’s teams were guilty of “major violations” (of the scholarship-losing variety) at Prairie View A&M. -You have the exciting, untested assistants. For the men, it was Rodney Terry and Chris Walker. On the women’s side, it was Travis Mays of LSU and Kelly Bond of Texas A&M. Mays was an especially exciting candidate, given his reputation as a recruiter, and calling UH the “perfect job for me”. That’s not a knock on James Dickey, and it’s not a knock on Buchanan. In both cases, there’s nothing wrong with the candidate’s resume. Buchanan was a good recruiter for UH back in the day, although it’s really hard to say if he did a good job or not at Houston Baptist. The school transitioned from NAIA to NCAA Division 1 while he was there, so it’s difficult to know what the standard for success is. He does seem excited about the UH job, which is nice to see. If Dickey was clearly the best candidate available for the men’s vacancy, or if Buchanan was clearly the best candidate on the women’s side, I wouldn’t be upset. The UH job, for both genders, comes with serious question marks. Can you recruit to a small conference? Can you recruit to less-than-ideal facilities? Can you recruit to a less-than-ideal fan base? Can you drum up some interest from the campus and surrounding community? But the head-scratching begins at the surprisingly high quality of candidate that was available. Fill-espy comes with a proven track record of turning moribund programs into winners. Cooper-Dyke is a big name from her days with the Houston Comets, and has done impressive things with PVA&M. If said big name isn’t affordable, or comes with undesirable baggage, why not go the Kevin Sumlin route, and look for an up-and-coming assistant? Some of the top assistants in the country were interested in the job. Let’s be honest, the Houston Cougar athletics department is going to live and die by its football team. As long as things are looking up for Sumlin and the boys, nobody’s going to complain too much for too long about anything else. Sure, there’s some crying right now about the Dickey hiring, or the baseball team underperforming, but come football season, is anybody still going to care? This is what bothers me about how Rhoades handled the basketball hirings. He essentially had two free hires. And instead of aiming high, he went the safe route. We may not have hired a Sumlin, but we hired two guys who won’t embarrass the school. Why? Is that what anybody really wants? After six years of good-not-great under Tom Penders, doesn’t it seem like everybody is ready for, well, anything else? ElViento: New Houston Cougar head basketball coach James Dickey hasn’t wasted much time in bringing some assistants on board. In the last few days, Daniyal Robinson and Ulric Maligi have left their assistant positions at Iowa State and Stephen F. Austin, repsectively, to come on to the Dickey staff. Both are young, and both are believed to be good recruiters. Robinson has helped Iowa State bring in some very impressive talent the last couple years, talent which has helped the Cyclones defeat the Coogs on the hardwood two years running. Maligi is a former AAU coach, a likely sign that (as expected) this program will no longer continue to shun the AAU “sneaker pimps” when it comes to recruiting. I have to say, I am tempering my frustration on the Dickey hiring somewhat. I still can’t logically justify the hiring, but he it seems like he’s brought in some high-quality assistants, and I just really want to like the guy. He seems like a good dude. Even if he wasn’t my coach, how can you not root for a guy like him? Let’s hope that translates to actual on-the-court success. A once-promising season is on life support for the Cougar baseball program. Houston has lost six of seven, during which span the team has scored just 24 runs. The team now stands at 13-16 overall, with a 2-4 mark in Conference USA play. The Coogs have six conference series still to play, so the season isn’t lost by any stretch, but questions abound for Rayner Noble’s squad: where have the bats gone? When will Jared Ray get healthy? Where is Chase Dempsay? Houston finishes up its series with TCU today, plays at Texas-San Antonio on Tuesday, and then hosts Memphis next weekend as conference play gets back underway. The Tigers, aside from a shocking series win over Rice, aren’t very good. A series win is an absolute must, a weekend sweep sure would help get the Coogs back on the right track. Hoping to get its own season turnaround going is the Cougar softball program, which has stemmed a five-game losing streak with a four-game winning streak, during which span they have outscored opponents 39-0. That stretch includes a no-hitter by freshman Bailey Watts. After finishing a series with Memphis today (the Cougars read 5-4 at the time of me typing this), the Cougars head up to Tulsa for a weekend series. Best of luck to Kyla Holas‘s squad. That’s all for me for now. If you’re really bored, and want to read me ranting about movies, click on over. ElViento: No, I’m not leaving. Nobody wants to pay me to write, don’t kid yourself. Go back and read the first letter of each line from the previous post. Then check the date. Then say, “Crap, he’s not leaving.” Then continue on with your life. Anyway, imagine you’re the Athletics Director of a school in a similar situation to UH. You’re hiring a new basketball coach. You have two candidates – James Dickey and Tom Penders. Who would you choose? I’d take Penders ten times out of ten. It wouldn’t even be a hard choice. So why’d we run him out of town if we couldn’t do better than Dickey with this hire? John Lucas was never really considered, and Bob Marlin already went to Louisiana-Lafayette (fine, I didn’t like them anyway), which leaves us with three options: Dickey, a young assistant (think Chris Walker of Villanova or Rodney Terry of Texas-Austin) and retaining Penders. -Head coaching experience. This was reported to be a biggie for Rhoades. So it makes even less sense that he’d hire a guy who hasn’t been a head coach since 2001. What is the shelf life on head coachng experience? It can’t be nine years, can it? Big edge: Penders, followed by Dickey, then Terry/Walker. -Recruiting. This has to have been a big factor. UH doesn’t have the facilities to impress recruits, so that job falls on the coaching staff. Dickey will probably go after Texas recruits, specifically from the Houston area, but unless he can recruit the top-tier of the Houston area talent, who cares? In basketball, New England is at least as big a hotbed of talent as Houston, so what’s the difference between mid-level New England talent and mid-level Houston talent? Nada. Big edge: Proven recruiters Terry/Walker, followed by Dickey with a slight edge over Penders. -Ability to excite the fan base. An already paltry fan base had clearly turned on Penders. More than anything else, this is the reason he had to go. A ‘name’ coach, like Gillispie, Johnson or Van Gundy could have made a huge difference. An up-and-comer like Terry/Walker wouldn’t have made as big a splash, but at least would have reminded Cougar fans of the Kevin Sumlin hire. Penders would have been a tough sell, but at least he made the tournament this year, so he had earned some good will back. The Dickey hire has been an unmitigated public relations disaster. Let’s just put it this way: I got a “RHOADES/KHATOR RECONSIDER AMIDST PUBLIC OUTRAGE! WE’RE GETTING BCG! !” text message from a buddy yesterday, and even realizing that it was April Fools’ Day, I wasn’t 100% convinced it was a joke. It seemed plausible. That’s how much people are freaking out about the Dickey hire. So, big edge: Terry/Walker, followed by Penders, followed by Dickey. -Baggage. GIllispie’s got it, and it may have cost him the UH job. Lucas’s may have cost him a shot at being seriously considered. Penders left his last two jobs (UT-Austin and George Washington) under less-than-ideal circumstances. Terry/Walker haven’t been around long enough to accrue any, as far as I can tell. But at least Dickey doesn’t have any right? Oops, he left Texas Tech after a big academic scandal cost the school nine scholarships. Which is undoubtedly a big part of the reason that, you know, he hasn’t had a head coaching job in nine years. Edge: Terry/Walker, followed by Dickey and Penders in whatever order you want, it doesn’t matter. Final tally: recruiting, exciting the fan base, and baggage all favor hiring a young assistant like Terry or Walker. The only argument in favor of Dickey seems to be that he has head coaching experience. Head coaching experience, which, in case you’re just tuning in, is nine years old. In the sports world, if you haven’t done something for nine years, you might as well have never done it. It’s no longer relevant. Nine years after Phi Slama Jama, the Cougars missed the NCAA tournament, and didn’t return for the next eighteen. Because by that point, PSJ no longer mattered in any practical sense. I will show up to the games. I will cheer for the athletes that represent my school. I hope and pray that Dickey proves me wrong. And all of you should, too. But I’ve been telling people since Penders resigned that there were no bad candidates for the job. Not only did we find one, we hired him.